SEIU’s imposition of trusteeship means that Rosselli and all of his officers have been immediately removed from their jobs. Regardless of one’s stance in this dispute, this ouster of longtime UHW leadership, which includes some of the nation’s best grassroots organizers, is a sad development for UHW and — since UHW was central to organized labor’s political efforts in California — a blow to progressive politics in the state. Nobody expects Roselli, UHW officers, or the union’s 150,000 membership to view trusteeship as the end of the fight. Not by a longshot. The effective organizing and advocacy strategies and tactics that UHW has long used against hospitals and nursing homes will now be employed against SEIU. And the same holds true for SEIU’s use of its highly skilled organizers, many of whom will be dispatched to California to implement the trusteeship. As Roselli repeatedly pointed out during Monday’s press conference, federal labor law gives international unions tremendous power over their locals. So it’s clear that UHW is not depending on the courts for help, but believes it can win this battle through grassroots pressure. Roselli signaled one possible tactic when he noted that Nancy Pelosi and George Miller had thousands of UHW members in their districts. Pressure from these constituents could push these powerful political leaders to try to broker a compromise with SEIU, though the persistence of this conflict may show that they are unable or unwilling to intervene. UHW claims SEIU has a corruption problem? Stern cites hearing officer Ray Marshall’s finding that Rosselli was guilty of financial malfeasance. 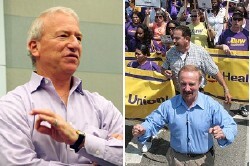 As the SEIU-UHW fight gets nastier, will it impact the national agenda? The traditional national media has provided some coverage of this dispute, but Steven Greenhouse of the New York Times, perhaps the nation’s most respected mainstream labor journalist, has framed it as an internal union fight. Neither the Times nor the Washington Post has cast the battle in the “struggle for union democracy” terms that UHW sees as the essence of the conflict. Many longtime labor activists are staying out of the fight, not wanting to pick sides. And there has been very little media coverage in local papers outside California, so many progressive activists are not well informed on the dispute. SEIU’s desire to keep this dispute off the national radar screen is also abetted by the timing. Progressives are focused and mobilizing around Barack Obama’s first 100 days and beyond, making it harder for an internal dispute within SEIU to spark national interest. Stern has named Eliseo Medina and Dave Regan as trustees of UHW. Medina attended an SEIU rally around the state budget in Sacramento last Friday, and is likely to continue such public activism in his role as trustee. Like Medina, Regan is an Executive Vice-President of SEIU, reflecting the importance SEIU is placing on ensuring UHW runs smoothly in the months ahead. But SEIU must know that if faces a major obstacle in its attempt to run UHW under trusteeship: UHW members are intensely loyal and completely committed to their cause. This is not Sal Roselli and some leaders manipulating line workers—this is the union membership rising up and fighting a ground war to preserve their elected leadership. Those who tried to resolve this dispute short of trusteeship have failed. And as progressives mobilize to implement real change during Barack Obama’s first 100 days, SEIU and UHW are locked in a fight that will cost millions of dollars, divert potentially hundreds of organizers from other campaigns, and turn longtime labor movement allies into adversaries.